Time for me to give my annual Hangover defense. 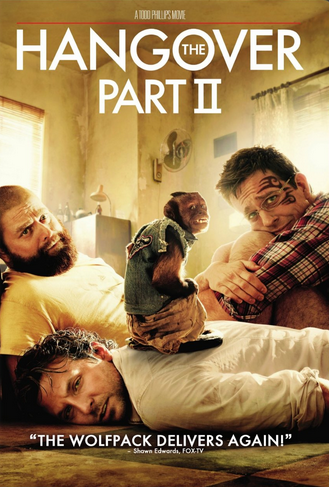 I swear, I probably say this once a year: I love the first Hangover movie because it was one of the best written comedies of the past five years. There was incredible chemistry between the leads, the twists and turns came out of nowhere, and it was very effective at making fun of the stupidity of the leading men. It was a great time. I knew The Hangover Part II probably wasn’t going to be good. But I was drawn to it as fans of The Original Movie are inevitably drawn to sequels. You have to know. You have to know if it’s as terrible as the critics say it is, or if this thing is just being misunderstood. You have no know if there’s a slim possibility that it was made with you in mind, not awards and prestige. You have to know. So you see the movie, and nine times out of ten you learn that the movie is indeed bad. But you know. You know now. And that difference in knowing is everything. The gist: The main dudes of the Hangover, a.k.a. the Wolf Pack, are back in time for one more wedding. It’s the wedding of the most straight-laced dude of the bunch, and he doesn’t want anything crazy to happen. Smart dude. He doesn’t want to f*ck it up. But chemicals still get loose into the dudes’ food, because they associate with awful people. But instead of the groom, they’ve now lost the bride’s square little brother. Also, he’s lost in real-deal Bangkok. Can the Ugly Americas save him? What I “learned”: Lightning really can’t ever strike twice if you’re going for the same concept across a franchise. Evil Dead was in many ways a perfect franchise because each of its entries were starkly different. This movie doesn’t try to be different in any way, and doesn’t even mock that fact like 22 Jump Street. There’s no authenticity anymore. You’re left just wondering why these guys are even hanging out anymore. See this movie if you like: Movies starring these particular actors. I honestly can’t think of any other reason to see this movie. These actors are clearly talented people who were handed a terrible script. If you’re fans of them, you may indulge with less guilt than the average person.